A data loader is a tool that allows a user to upload new software applications and data on embedded software components of an aircraft. It is typically offered as a rigid combination of hardware and software that provides data loading via specialized hardware interfaces (e.g. ARINC 664 chipsets). Typically, these interfaces cost upwards of a thousand dollars. Performance Software has recognized an opportunity presented by the ARINC 615A standard, which introduces ethernet technologies as the medium to support data load operations, developed its own data loader solution, and effectively cut out the need for this specialized hardware. The two standards that define data loading are ARINC 615 and ARINC 615A. The former was introduced in 1989 (and most recently revised in 2001). It specifies data loading communication across ARINC 429 network links between the data loader and loadable targets and outlines combinations of specialized hardware and software as possible data loading solutions. ARINC 615A was published in 2001 and specifies a high-speed data load via ethernet, effectively replacing the need for A429. By specifying ubiquitous ethernet technologies as the networked medium to support data loading, A615A expands A615’s definition of data-loading solutions and enables the personal computer as a viable hardware interface. The user interacts with the “A615A (Data Loader)” block. 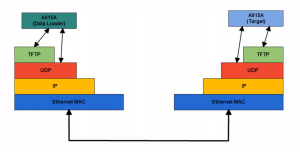 The bottom four blocks are the common internet technologies available in a modern local area network (LAN). Depending of the operation that is invoked by the user, the data loader and target interface via Trivial File Transfer Protocol (TFTP) or, in the case of the FIND operation, via UDP datagrams. The usage of the LAN stack means the data loader application can be implemented on all LAN capable devices, including laptop PCs. The Performance DataLoader product suite is comprised of the component libraries and the DataLoader application. The component libraries include the TFTP, ARINC 615A, and ARINC 665 libraries. These libraries support the load operations according to their eponymous standards. For instance, the TFTP library includes an implementation of the TFTP protocol that is abstracted from the I/O mechanisms that send and receive messages. This means the TFTP library is adaptable to a variety of I/O methods, including ethernet using Winsock or Linux sockets, ARINC 664 using an A664 interface card API, or A664 using standard ethernet. Using the component libraries, Performance has developed the Performance DataLoader, a loader application that utilizes the functionality of the component libraries to provide ARINC 615A load server operations. The Performance DataLoader is a software only based utility that targets Windows-based PC devices and is designed to be both modular and portable. It provides useful features such as support for automation via command line access and scripting APIs. Future features include a test framework for verification of custom client data loading applications and configuration options to allow for error injection into A615A operations. Performance offers the DataLoader component libraries as standalone products to help create embedded data load clients for its customers. The libraries implement functionality, specified by the previously mentioned TFTP protocol and ARINC 615A and 665 standards, that comprise the normal loading activities, such as upload, FIND and information operations, and can be used in custom data load client applications. As a services-based software firm, we also offer services to help implement the final load client application using the Performance component libraries. Performance’s suite of ARINC 615A libraries and applications can provide for a faster path to complete data load solutions. The cost of the component libraries for use as a foundation for development of load clients is based on specific customer needs and can be negotiated. To learn more about our DataLoader product suite and its associated services, visit our DataLoader solution page.